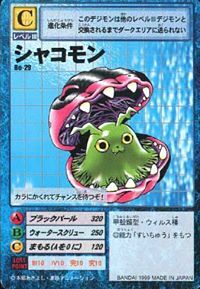 A Digimon shaped like a bivalve covered by a hard shell. Because it rapidly developed its shell, its inner structure has become slime-shaped like that of a Baby. It is a cunning fellow who tempts the opponent with its cute face, and attacks them once they draw near. Also, in its closed shell state, it has such high defense as to easily deflect trivial attacks among other things. 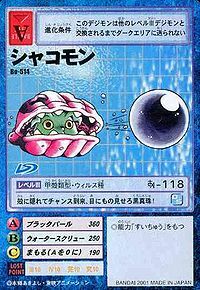 Its Special Moves are shooting a hardened sphere produced within its body at the opponent (Black Pearl), and hitting the opponent with a high-pressure water current (Water Screw). 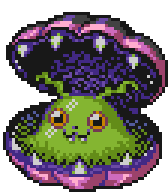 A Shell Digimon covered by a hard shell. It lures others in with its cute face, and attacks them once they get close. Not only that, its defense reaches great heights once it is enclosed within its shell, causing all attacks to bounce off. Its Special Move is hitting the opponent with a high-pressure water current (Water Screw). 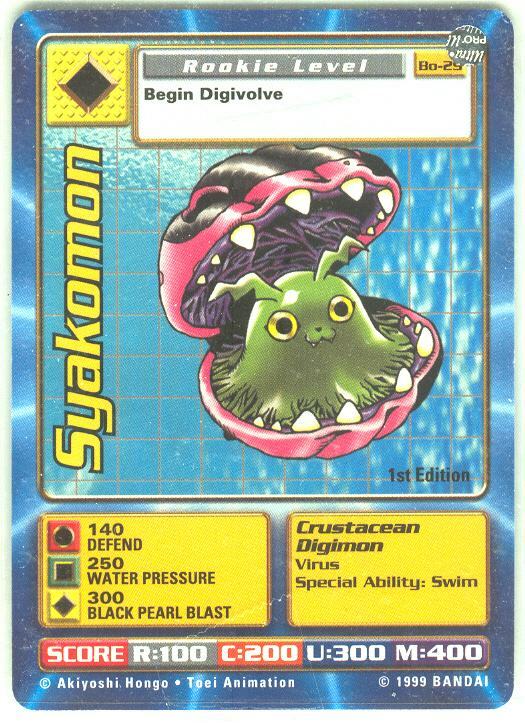 A Crustacean Digimon in the shape of a bivalve, which is covered by an extremely hard shell. 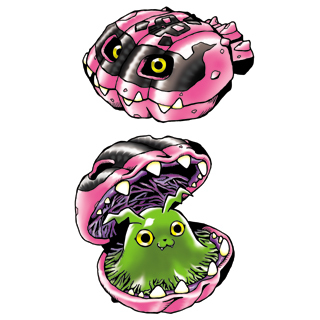 As both the shell and the insides are considered a single Digimon, the rapid development of its outer shell caused its inner structure to remain at a Baby-like slime state. It is hard to imagine that its innocent-looking appearance belies a cunning personality, where it lures opponents in with its face and attacks them once they get close. Not only that, its prided shell provides it with great defense, so even if the opponent tries to counterattack, it deflects normal attacks once it is enclosed within its shell. It is hard to hate its Special Move, an attack where it creates a hardened, pearl-like sphere within its body and shoots it at the opponent's weaknesses (Black Pearl). From Shakogai 「硨磲貝（シャコガイ）」, a family of bivalves (Tridacnidae) which species include the giant clam. Syako is a Nihon-shiki romanization of 「シャコ」. Black Pearl  ブラックパール Burakku Pāru Black Pearl Blast Opens its shell and shoots a black pearl at the foe. Water Screw  ウォータースクリュー Wōtā Sukuryū Water Pressure Shoots a jet of high-pressure water at the enemy. First appeared in Digimon Adventure 02 - Episode 40. Three Shakomon were partner Digimon of the Hoi Brothers, three of the international Chosen Children. These Shakomon can all evolve to Octmon. Shakomon is an obtainable Digimon. 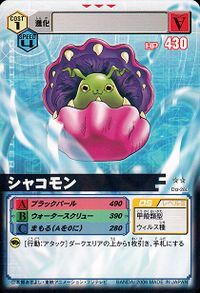 Can evolve to Octmon (0-2 DP) or Gesomon (3+ DP). Can evolve to Coelamon, Shellmon or Karatuki Numemon. Can also be Jogressed with Dot Agumon to get Ebidramon. 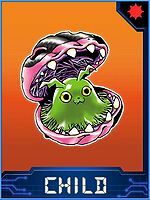 Shakomon is available as a collectable card. Evolves from Pukamon. Can evolve to Ikkakumon, Seadramon, Gesomon or Octmon. 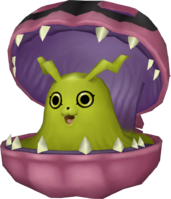 Shakomon is an enemy Digimon in Area 01. Shakomon is an enemy Digimon. It hides in its shell, waiting for its chance! It hides in its shell until a chance arrives, and attacks with its black pearl! ↑ "Release date of Digital Monster: Version S (September 23, 1998)"
↑ Digimon Adventure 02: "The Great Free-for-all Fight in New York and Hong Kong!" This page was last modified on 3 March 2019, at 22:36.